LAHORE: Domestic cement consumption bounced back in September 2018 after two months of lacklustre growth, showing a double-digit increase compared with the same month last year. A continued buoyancy in exports helped the cement sector post 18.9% growth in the month. According to a spokesperson for the All Pakistan Cement Manufacturers Association, the cement industry sold 3.806 million tons in September 2018 as opposed to dispatches of 3.201 million tons in September 2017, up 18.9%. 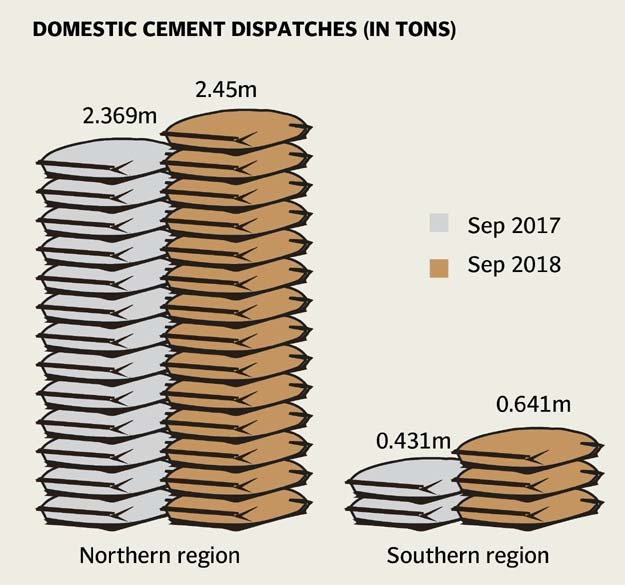 In September 2018, domestic cement sales in the northern region were 2.45 million tons, higher by 3.45% from 2.369 million tons in September 2017. Sales in the southern region were 0.641 million tons in September 2018, up 48.81% compared with 0.431 million tons in the same month last year. Exports from the north stood at 0.294 million tons in September 2018, which fell by 4.69% against 0.308 million tons in September 2017. Shipments from the south were 0.421 million tons, up 350.92% compared with 0.093 million tons. However, the industry closed the first quarter of the current fiscal year on a moderate note. In July-September 2018, cement units sold 10.813 million tons, higher by only 4.48% than the 10.349 million tons dispatched in the corresponding period of last year. This increase was lower than the high growth the industry maintained in the past five years. The growth in the first quarter also did not match with the increase in production capacity of the industry in the current calendar year. The industry utilised 79.75% of its capacity in the first quarter compared with average capacity utilisation of 87% in the previous three years. Most of the cement production capacity is located in the northern part of the country. “These mills remained under immense pressure in the first quarter,” the spokesperson said. They dispatched 7.151 million tons of cement during the three-month period, which was 4.94% less than sales of 7.523 million tons in the same period of previous year. Exports from the north declined by 21.58% to 0.747 million tons compared to 0.953 million tons in the first quarter of previous year. Mills in the south were in the driving seat as domestic consumption in the first quarter increased by 21.51% to 1.870 million tons from 1.539 million tons in the same period last year. Exports also increased from this region by a whopping 212.13% to 1.044 million tons from only 0.334 million tons during Jul-Sept 2017. The spokesperson said taxes on cement were the highest in the region and urged the government to take concrete measures to reduce the taxes. To consult stakeholders or not!